A triump! 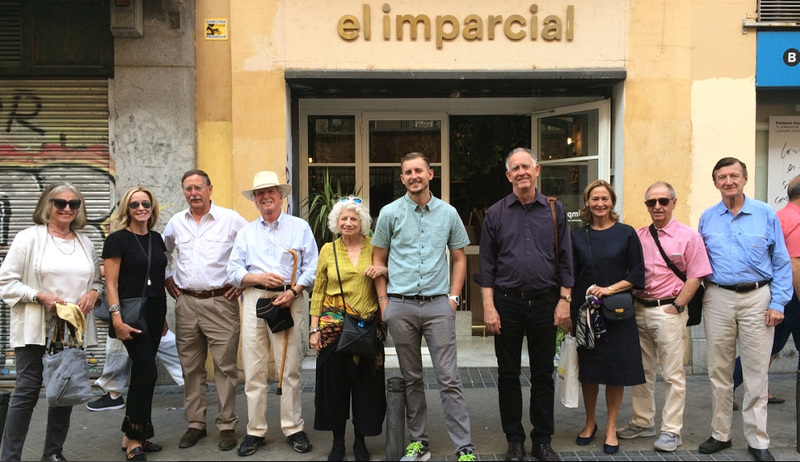 Finding our way to El Imparcial, a great restaurant in Madrid’s old center. Bill Cook prepares the group to see Guernica, with a history of the Spanish Civil War. Bill Wallace lectures on the Primavera, in the Ufizzi’s Botticelli rooms, newly restored by Friends of Florence. Bill Cook lectures during our private visit to the Palazzo Strozzi exhibit featuring six important works restored by Friends of Florence. So lovely! 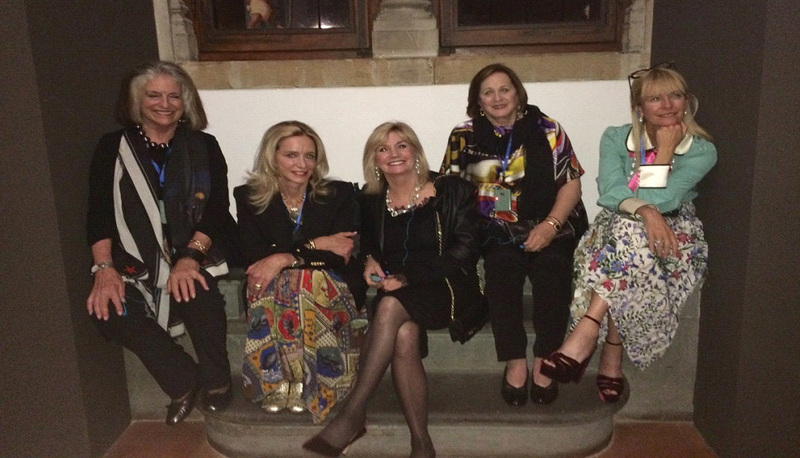 Ann, Sandy, Peggy, Nancy and Lora take a window-side seat during the lectures in Palazzo Strozzi. 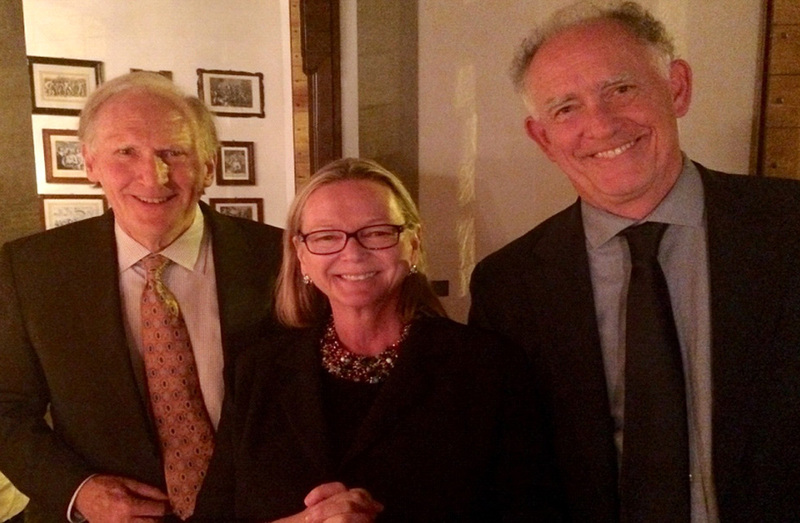 Jeff, Simonetta and Bill at the Farewell Dinner in Palazzo Antinori. Additional historians will join Friends of Florence during the program. Arrive at The Westin Palace Hotel in Madrid. 6PM - Welcome session at the Palace Hotel, including introductory lecture by Professor Bill Wallace and Dr. Bill Cook. Welcome cocktail in the hotel. Dinner at the historic restaurant, El Lando. 8:30AM - Gather in the lobby. Departure – to the Prado Museum (we will walk the short distance). 9AM – Private early entry to the Prado Museum (Prado opens to the public at 10AM). Visit the Restoration Laboratory of the Prado, arranged through the American Friends of the Prado Museum. Lunch at the Madrileno Cervezeria Alemagna. Afternoon visit to other sites in the city. Cocktails in a typical Madrileno bar. Dinner in the oldest restaurant in Europe, Casa Botin, dating from 1725. Saint Mary, the Church of Saint Tomè, and several other sites. Dinner in a private venue. Visit to the Thyssen Bornemisza Museum and the Reina Sofia Museum. Depart Madrid; travel to Florence by air. Check in to Westin Excelsior Hotel, Florence. Private visit to the Uffizi Gallery for further exploration of the Spanish and Italian Masters. Dinner in a private palace. Morning visit to the Pitti Gallery, the Church of Santo Spirito, and other sites. Farewell dinner in a private palace in Florence. The gallery fell silent as Prof. Wallace stopped speaking. We stood there, riveted, looking. Perhaps, really seeing for the first time. We all knew Picasso’s Guernica from photographs. Yet, as he spoke before this great masterpiece, and guided us through the picture, we felt the horrors of war, the devastation, shattering of glass, falling of buildings and tearing apart of people. The screams of mothers carrying their dead children filled the silent room. Picasso’s genius touched our souls as we were humbled by his art. 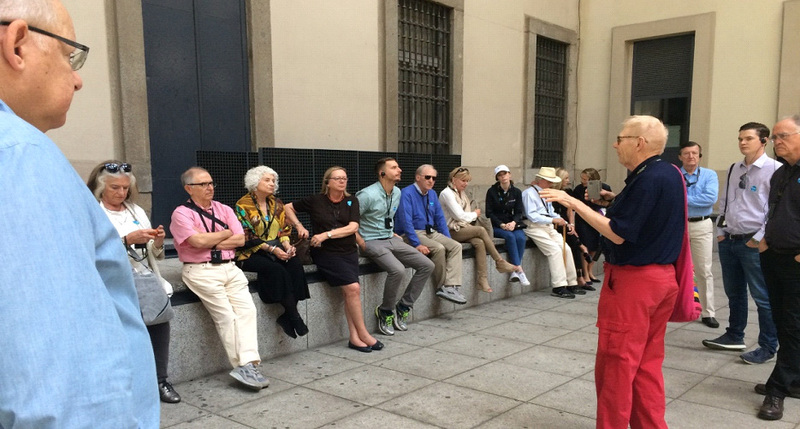 This special Friends of Florence trip was billed as Exploring the Masters of Spanish and Italian Art. But as with all Friends of Florence trips, there are special moments that don’t appear on the program. Moments that the group will recall for years. Standing before Picasso’s Guernica, hearing Bill Wallace tell us about its history and Picasso’s achievement, was one of those moments. Guernica, painted in 1937 told the world about the human agony of mass bombing. In 2017, its lessons still hold true. Our group of 31 met in the beautiful city of Madrid to join Simonetta, Prof. Bill Cook and Prof. Bill Wallace (affectionately called “the Bills”) to learn about the Spanish collecting of Italian Renaissance art, and view a lovely Fra Angelico Annunciation in The Prado -- for a possible joint restoration project with the Friends of the Prado. While Bill Cook, our historian, helped us understand the religious and historic context of the Prado’s great collection, Bill Wallace, our art historian, took us to see the great art collected by the Spanish Kings, who ruled much of Europe through the 16th and 17th centuries. We saw gorgeous paintings by Botticelli and Raphael, the best collection of Titian, two special Caravaggios, and importantly, the great works by Velazquez and Goya. A day trip to Toledo helped us better appreciate the genius of El Greco, seeing his two greatest paintings in their original locations. And of course, since it was a trip planned by Simonetta, the food and wines were spectacular. From suckling pig to Madrid’s famous beef, tapas galore and special venues. All just perfect, and capped by a rooftop dinner at the Thyssen-Bornemisza museum where our friends Duccio, Caravaggio, Tiepolo, Van Gogh and Renoir awaited us. Following four full days in Spain, we boarded our flight for Italy to continue our art exploration in Florence. 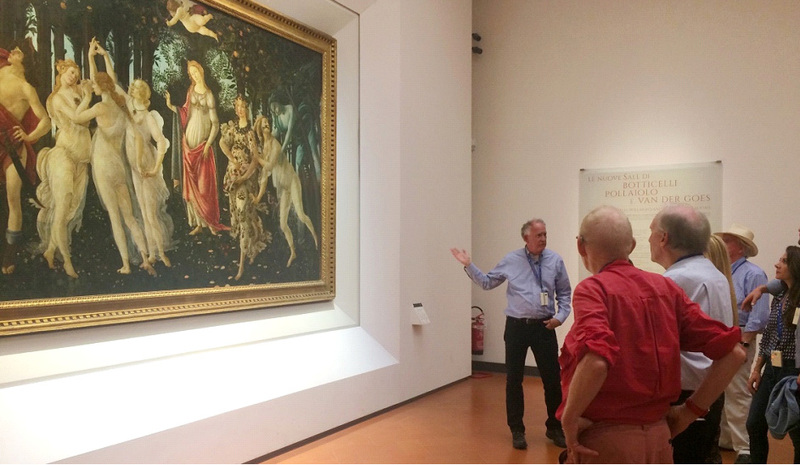 Our private visit to the Uffizi allowed us time in the newly restored Botticelli rooms (by Friends of Florence), where Bill Cook reveled in explanations of the religious saints, and Bill Wallace focused on the themes of Botticelli’s Birth of Venus and Primavera, all about love! Our private visit to the exhibition in the Strozzi Palace was another highlight. Six of the show’s breathtaking works were restored recently by Friends of Florence, including Michelangelo’s model for the Medici Palace, Pontormo’s altarpiece from Santa Felicità, the Allori paintings from Santo Spirito and the newly recovered Bronzino. 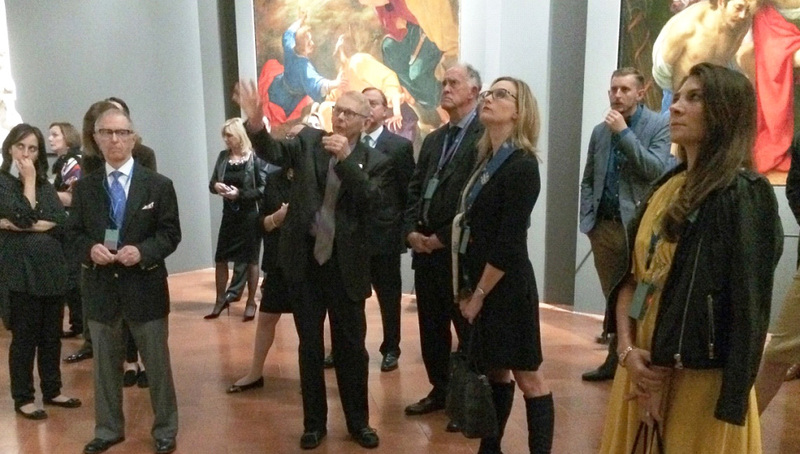 Here, we gazed in awe at the brilliant colors of Florentine painting of the late 1500s while Bill Wallace wrapped-up the tour for us. He allowed us to see how the influence of these Italian masters traveled from Italy to Spain. Again, no Friends of Florence tour is complete without its private dinners. The Marchesi Rosaria and Ferdinando Frescobaldi welcomed us into their home adjoining Santo Spirito on the first night for a fabulous dinner with special wines. And the Marchese Piero Antinori and his family graciously hosted us in their beautiful palace on Via Tornabuoni for a truly elegant farewell dinner. Looking back on the trip, besides the art and the raising of funds to restore even more Italian Renaissance/ancient masterpieces, it is the people who make these trips so special. New friends and old friends – and best of all, the new young members, who will continue this wonderful mission and become future guardians of the past. Bonding over a common love of art and history, all contribute in their own way, and all made this trip one to remember.